Criticizing THE MAGNIFICENT SEVEN for being yet another in an awfully long line of unnecessary profit motivated remakes is kind of redundant, especially seeing as this new Antoine Fuqua helmed iteration is...a remake of a remake. Of course, this new western takes inspiration from the iconic 1960 John Sturges' film of the same name, which was also a remake - and a rather sly one - of Akira Kurosawa's 1954 masterpiece SEVEN SAMURAI. What you can criticize Fuqua's film of, though, is being achingly safe and pedestrian with the underlining material itself and never fully exploiting it - and his remarkably assembled cast - to their fullest effect. That's not particularly magnificent at all. THE MAGNIFICENT SEVEN is a walking cliché factory; there's simply no western genre troupe stone left unturned here, and we've frankly been exposed to these types of stories over and over...and over again. You know, the ones featuring a small dust covered town in the middle of nowhere that's being terrorized by a villainous thug that wants it for his own, leaving one lone and brave soul seeking out a ragtag group of men to help defend it. There's a definitive formula that permeates every pore of THE MAGNIFICENT SEVEN, and I can certainly understand why Fuqua and company wanted to re-capture the 1960 version's narrative essence. Yet, why assemble such a seasoned group of endlessly talented people in front of and behind the camera when all they're doing is lazily regurgitating a convention riddled plot that makes very little concerted effort to subvert the genre in refreshing new ways. What ultimately helps save this film a bit is, yes, its incredible performance ensemble, and most of the actors here give far better performances than the otherwise prosaic scripting affords them. That, and Fuqua at least opens the film with a relative and unsettling bang as we're introduced to the aforementioned villainous thug in the wondrously named Bartholomew Bogue (a twisted and sinister, but frankly underused Peter Sarsgaard), who swoops in with his men to a small 1879 frontier town and gives them all a "deal": He will lowball offer them all $20 per parcel of land...and for anyone that doesn't take the offer...well...they'll be forcibly removed from the land. He gives the townsfolk three weeks to make up their minds, which is maliciously hammered home by a very public act of violence that kills one of the citizens in front of the church and in broad daylight. One of the town's victims and new widow thanks to Bogue's actions, Emma Cullen (a decent Haley Bennett, who looks astoundingly similar to Jennifer Lawrence), decides that she's not going to take the oppressive invasion of her town sitting down. She travels to various surrounding locales to recruit as many hardened gunslingers as she can to defend her town's livelihood. She locates one in bounty hunter Sam Chisolm (Fuqua regular Denzel Washington), who in turn recruits more men, including the frequently inebriated Josh Faraday (a rascally Chris Pratt), Mexican gangster Vasquez (Manuel Garcia-Rulfo), ex-Civil War sharpshooter Goodnight Robicheaux (Ethan Hawke), the knife wielding Billy Rocks (Byung-hun Lee), legendary trapper Jack Horne (Vincent D'Onofrio) and Camache Red Harvest (Martin Sensmeier). Together, these - ahem! 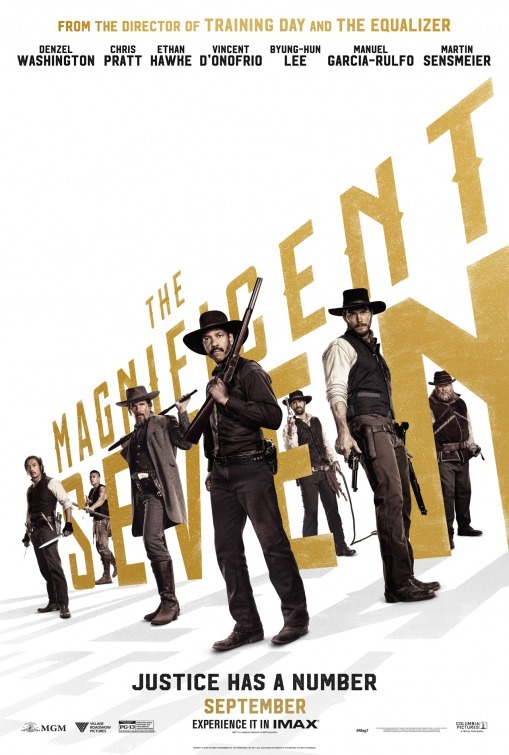 - magnificent seven overcome their petty differences and respective dark pasts in order to rid the world of Bogue's marauders once and for all. THE MAGNIFICENT SEVEN traverses from one inordinately predictable plot beat to the next with sometimes painful obviousness. The story shuffles from point A to B and finally to C without much in the way of any tangible scripting surprises, especially for those viewers that are even modestly familiar with the relatively dozens upon dozens of other past western films with the same core narrative. When it becomes very clear very early on that you know precisely where THE MAGNIFICENT SEVEN is headed at nearly every turn it has the negative impact of stymieing the film's overall momentum and sense of suspense. There's also a point to be made that western and action films are only as good as their villains, and THE MAGNIFICENT SEVEN rather regretfully has a poorly rendered one in Sarsgaard's Bogue. You can sense the actor's moustache swirling commitment to the part, but after his early appearance in the first few scenes he's never heard from again for nearly an hour an a half. The film simply needed more scenes developing this man as a legitimate threat. All in all, Bogue is a fairly one-note antagonist without much embellishment. Thankfully, Fuqua is a solid cinematic craftsman that knows how to make good looking pictures, and THE MAGNIFICENT SEVEN is no exception. The period production values are resoundingly on point, not to mention that Fuqua can handle action sequences with the best of them, albeit in a somewhat bloodless PG-13 variety here. The gunfights and standoffs in the film are quite few and far between, but when they occur they're unleashed with a rapturous glee. The climatic showdown between Chisolm's and Bogue's squads in the film's final act perhaps goes on longer than it really needs to (which makes the film's two hour plus runtime unintentionally feel far longer), but there's no question that Fuqua wholeheartedly delivers during this extended sequence with the type of never-look-back confidence that has typified his previous action films OLYMPUS HAS FALLEN and THE EQUALIZER. On a level of showing an all-out small scale war between western heroes and villains, THE MAGNIFICENT SEVEN is unpretentiously entertaining and exhilarating. The camaraderie of the compellingly diverse cast here is also a hoot to behold, not to mention that it's momentarily thrilling to see former TRAINING DAY (also a Fuqua effort) stars Ethan Hawke and Denzel Washington have a wonderful moment of reacquainting themselves that provides one of the film's few intimately rendered character moments. Hawke is quite good at playing an unpredictably unhinged sniper with a haunted past, even though his character's obligatory and inevitable redemption can be seen from a mile away. Washington isn't particularly challenged playing the authoritative Chisolm, a role that he inhabits relatively in his sleep...but altogether rather well. Chris Pratt lays on the highly appealing Prattian charm as his zinger unleashing quick draw man that, to be honest, is a character archetype that he's playing a bit too much of in too many films to the point of being typecast (granted, he's so solid at it that it's hard to fault him). Then there's some peculiar performances, like D'Onofrio's bizarre turn as Jack Horne that comes off as so idiosyncratically creepy at times that you have to remind yourself that he's one of the good guys. If you want a good genre shoot-em-up, then THE MAGNIFICENT SEVEN should be right up your alley. The film has a Saturday matinee vibe that serves it well at times and is populated by a cast that thoroughly invests themselves in their respective parts when the screenplay has other ideas. I like the personalities of this motley crew and appreciated the aesthetic strengths of Fuqua in giving his western an authentically grounded sense of texture. Having said that, it would have been nice to hear Elmer Bernstein's classic theme from the 1960 film sprinkled in more here, especially seeing as the musical score (a combination of the late James Horner - who died before he could finish it - and Simon Franglen) feels audibly disjointed. It also would have been ultimately nice to see the cast and crew push the boundaries of this genre forward with some innovation. THE MAGNIFICENT SEVEN has its share of modest pleasures, to be sure, but it squanders its own inherent potential. Is it too much to ask for a film like this with such an exemplary crew to try to move beyond a slavish reliance on a very worn-out western movie blueprint?